Just because a poem is published in a collection doesn’t mean it’s completely finished, never to be changed again. I think I agree with whoever it was who said “a poem is never finished.”* If I’m ever lucky enough to publish a full collection, some of the poems from The Misplaced House will require stitches. Some might not survive the operating table. But then again…. Different poems appeal to different people. One of the pleasures of the last six months has been receiving messages – often on Twitter and Facebook – from readers who have told me which poems they like best. There’s been a surprising variety. Even some of the poems which I now think require a little more attention have been appreciated. Which goes to show that acquiring a sense of your own poetry, of what’s ‘working’ and what isn’t, is an ongoing, not easily achievable, process. I wish I’d worked harder at my titles. I think some of my poems would benefit from a clue in the title to indicate what the poem might be about. At poetry readings, I’m able to give a little context for each poem and I’d like to find a way of incorporating that context into my titles. Definitely something for me to work on. And talking of readings….. I should have started to arrange them as soon as tall-lighthouse said they would publish The Misplaced House. Instead, I waited until I had the book in my hands and then started to make enquiries. Not surprisingly, many reading series are already booked for the rest of the year. I must confess that I didn’t give enough thought to the time, effort and energy needed to try to arrange readings! Again, something for me to work on. And, still on readings, I’ve learned that it’s not easy to read the same poems over and over again! How to stop feeling (and, worse, sounding) bored? I’ve had to find new and different ways of reading the same poem. Reading new work, in-between poems from The Misplaced House, helps. Just being aware of how I feel, and making an effort to sound alive, also helps! Being on social media has helped sales. I wrote a bit about this here so I won’t go into it again other than to say, yes, it’s worth it. Hardly a soul, in fact, only one person outside my family, has commented that it’s ME on the cover of my book! Me and my younger brother, Andy. And a stray dog, of the kind that roamed the street in my childhood. Thank you. I self-published using Amazon Kindle and in May of this year issued a print edition via Berforts. I have, however checked out the press used to publish your work which looks interesting. 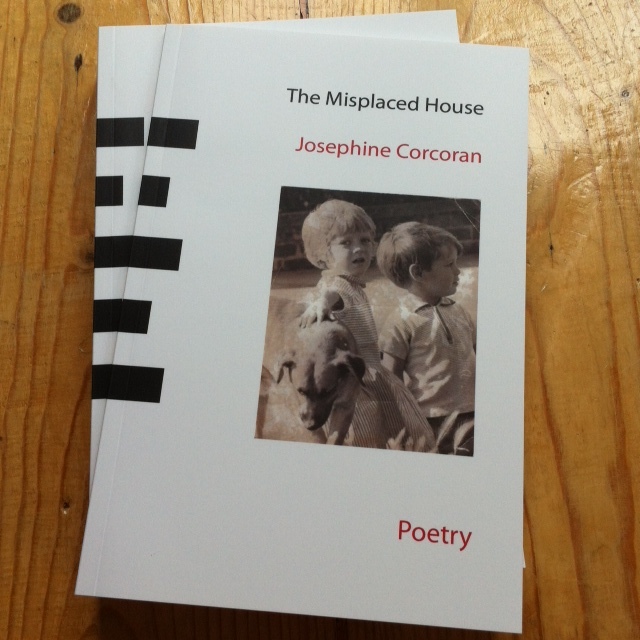 Incidentally I have ordered “The Misplaced House” and look forward to reading it. Being blind I will request RNIB to transcribe it into braille. Thanks, Kevin, that’s very kind of you. As a chronic sufferer from CED (compulsive editing disorder) I agree entirely. Funny thing is, though, it’s often the case that the pieces I am least happy with, which on reflection seem clunking and unwieldy to me, are the ones that others like best. De gustibus non est disputandum, as some Roman or other once said. Well, I reckon that saves me trying to articulate what I think about having a book – yes it’s a BOOK, Josephine – out there. Oh, and yes; titles. Them too. Thank you. I think you should have your two pennies worth as well, actually, Mr Foggin 🙂 Titles, yes, a whole scholarly enterprise could be expounded upon ’em. Josephine, I wholeheartedly agree re poems never being finished. On a personal front, I’m regularly surprised to find that readers’/listeners’ favourite pamphlet poems often aren’t the ones I think are the best ones – or my favourites. Happy six month anniversary! by the way…chapbook or pamphlet? someone tells me pamphlets are stapled and chapbooks have the bookblock glued into the covers. But what I say say is, they’re books. So I was saying, ‘The misplaced house’ is a BOOK, and a jolly handsome one, too. Different people seem to have different definitions, John, so I’m not sure. tall-lighthouse calls them pamphlets so I go with that. Thanks for this, Josephine, and a lot of it rings true (for me anyway). Good point about arranging readings early on – I just read a post on Paul Stephenson’s blog about the editing & production process for his Smith Doorstop pamphlet, and the final thing he says (having had the copies delivered) is ‘now to organise some readings’ – too late to point him to your post! Regarding the reading of the same poem(s) over and over, I know what you mean! I’ve found it helpful to remember some singing advice I was given which was to really focus on the words and the emotion or thought behind them, and when that happens each performance is meaningful and fresh. I only have one poem that I read a lot (because it’s the one people want to talk about afterwards) and I try to think in terms of ‘I’ve never told you this before, but I’m going to share a very personal story’. Looking into people’s eyes also helps, I think, because the connection always then feels different and real. Your first pamphlet – but not the last! Great to get these insights. Isn’t it interesting how much we learn through process or should I say ‘processing?. Isn’t it great to always be learning? Glad to hear you’ve had a positive six months and have ideas to keep developing your work. Congrats on the anniversary. I will try and hunt down a copy ( i suspect I might have to order it direct) in Australia.